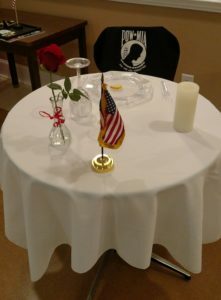 Master Sergeant John Y., United States Marine Corps veteran was honored on July 15, 2018, with a “We Honor Veterans” ceremony held at the American Legion Post 116 in Fuquay-Varina. The white cloth represents the purity of their response to our country’s call to arms. The empty chair depicts the unknown face representing all those who are not here with us. The single red rose reminds us of the families of their loved ones. The ribbon represents our determination to account for them. The candle and its ribbon symbolize the everlasting hope for a joyous reunion. A slice of lemon reminds us of their bitter fate. The salt symbolizes the tears of our missing and their families. The inverted glass reminds us our comrades cannot join us in a toast. John served 22 years in the Marine Corps, on the USS Des Moines, in the military police, and as a meteorologist. 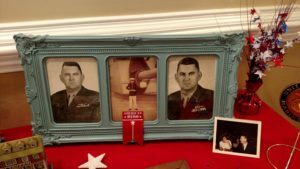 He served two tours in Vietnam and served in Korea and Okinawa.